I saw this beautiful bird at the dam yesterday after biking home from Needham. The world was very shiny. The sun was glorious. There were Constable clouds gliding this way and that in the sky. A few families were having picnics in the park. The water was rushing over the dam and creating a wonderful soothing din. 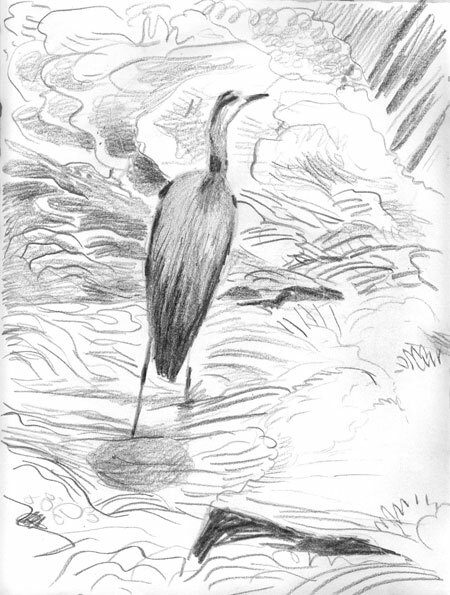 And there was this pristine, well-coifed heron standing up to the torrent seeking its lunch. Just gorgeous like a stately supermodel. The brilliant noonday sun casting his oval shadow on the rushing foam below. Try to get outside people. It's officially Summer this week!